Image: Camelia Dobrin/Getty Images. Design: Ashley Britton/SheKnows. I was in my early 20s when I first began experiencing symptoms of what was eventually diagnosed as lupus. Because my most pronounced symptom, especially at first, was extreme exhaustion, I speculated I might have chronic fatigue syndrome (also known as myalgic encephalomyelitis). When I mentioned this to my doctors, I was swiftly dismissed. They had a laundry list of reasons I wasn’t suffering from a real physical illness: I was a young, stressed-out perfectionist working long hours at a competitive corporate job in New York City. I had been diagnosed with anxiety disorder and PTSD in my teens and continued to cope with both illnesses. Putting these things together, doctors told me, it was no wonder I was so tired. I was wearing myself out by worrying and working hard, and it was as simple as that. For five years, my symptoms gradually worsened, and I was finally diagnosed with lupus by an autoimmune specialist — but my doctors believe I may have a dual diagnosis of either chronic fatigue syndrome or fibromyalgia. (There is no definitive test for either of the two latter illnesses.) Many people are shocked to learn that I waited five years to get a diagnosis and begin treatment, but my story isn’t uncommon. On average, it takes 4.6 years to be diagnosed an autoimmune illness like lupus. And although the CDC estimates that anywhere between 836,000 and 2.5 million Americans have chronic fatigue syndrome, the organization believes the majority have not been diagnosed at all. It’s no coincidence that an underdiagnosed illness like chronic fatigue syndrome affects more women than men. Research — like this 2003 study in Academic Emergency Medicine and this 1994 article in the New England Journal of Medicine — has shown that doctors are less likely to treat women’s pain. And the “hysterical woman” myth is alive and well — symptoms of chronic fatigue syndrome are frequently chalked up to side effects of a mental illness. When patients sought help for CFS in the 1980s, it was referred to as “the yuppie flu” because the majority of those seeking treatment were affluent middle-aged women. 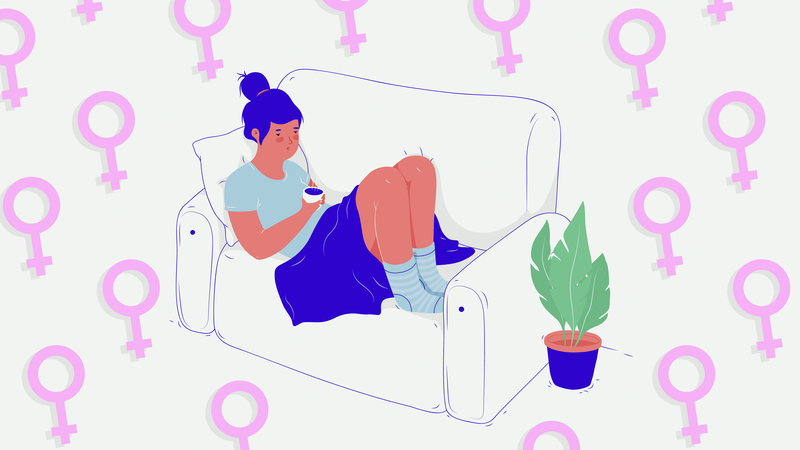 Although the phrase “yuppie flu” is no longer commonly used, CFS is frequently chalked up to something experienced by middle-aged, upper-middle-class women who are trying to “do it all” in terms of work, family obligations, emotional labor and caregiving. And it’s not just family and friends who dismiss people with CFS — doctors often dismiss the seriousness of a patient’s symptoms as plain old exhaustion from taking on too many obligations. As a result, it’s difficult to get a diagnosis and begin treatment. There are several reasons for this, and it starts with the name of the illness, Dr. Susan Levine, one of the foremost clinical experts on CFS and the former chair of the Federal Chronic Fatigue Syndrome Advisory Committee in the Department of Women’s Health at the Health and Human Services Agency, tells SheKnows. Many experts are seeking to change the official name to “myalgic encephalomyelitis” in order to lend more seriousness to a serious illness that is characterized by far more than fatigue. Then, of course, there’s the matter of how difficult it is to diagnose chronic fatigue syndrome. Unlike many other illnesses, there’s not a simple blood test or a biomarker that confirms a person has CFS. (Which is why my treatment team remains conflicted about whether I have CFS along with lupus.) Levine emphasizes that CFS crosses ethnic and socioeconomic barriers far more than we may think — and this is another reason the myth that it’s something primarily experienced by upper-middle-class white women is so damaging. “People who live in urban areas, have access to good insurance and have money” are more likely to be treated by doctors who will ultimately diagnose and treat them, Levine explains. “When you’re going to a Medicaid clinic, unfortunately, the provider doesn’t have the time to delve deeply enough to ask the right questions,” she says. “So they’ll just say it’s because you’re depressed, you’re stressed out, you’re working two jobs.” Because of this socioeconomic barrier, a huge part of Levine’s work involves trying to raise awareness among other doctors so they have the knowledge to at least send a patient to the right specialist if they don’t have the time or expertise to treat CFS themselves. But women (and men) with CFS are frequently dismissed by primary care doctors everywhere, not just in Medicaid clinics. I went through five reputable doctors in New York City and Seattle before I found a single one who was willing to delve into my symptoms and work with me to obtain a diagnosis. Levine tells SheKnows that part of the problem is CFS patients don’t look horribly ill, so doctors often don’t feel a sense of urgency or concern. “A lot of times, it’s young or middle-aged women. A lot of patients tell me that doctors told them having a baby or getting married would solve the problem,” Levine says. Further, Klimas tells SheKnows, “Far too frequently, women still suffer from dismissive misogynistic assumptions.” She says that, although she understands doctors are busy with back-to-back appointments and their med school curriculum probably never even devoted an hour to CFS, a lack of humility can cost patients dearly. Fortunately, the NIH is finally starting to pay more attention — and devote more resources — to CFS research. Levine tells SheKnows that Jen Brea’s critically acclaimed documentary Unrest is being shown to doctors and medical societies as another form of education. Meanwhile, CFS experts like Levine and Klimas will continue their extensive research and their mission to educate other doctors about the seriousness of the illness. Although progress is slow, people with CFS have allies in the medical community who are working diligently to ensure the CFS community is taken seriously. As someone who spent five years begging doctors to believe I was truly ill, I feel hopeful these steps will lead to a more educated, compassionate understanding of chronic fatigue syndrome and similar illnesses.